While all eyes are on Qualcomm for the impending release of devices containing their high-end Snapdragon 835 SoC, this morning the company has a slightly different kind of announcement to make. After nearly a decade since the launch of the Snapdragon brand, Qualcomm is undergoing a brand redesign of sorts ahead of their next-generation product launches. 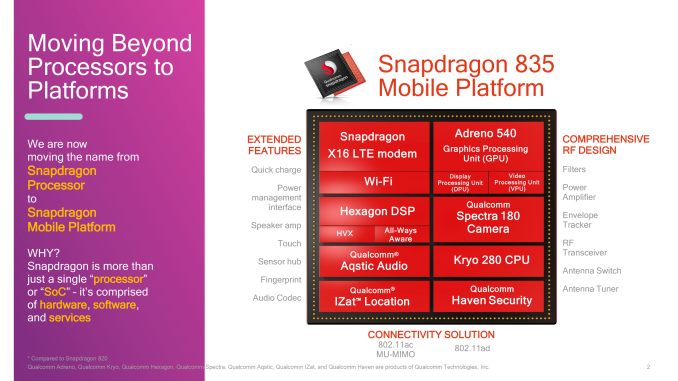 Starting today, Snapdragon is no longer a processor; instead Snapdragon is a platform. More formally, Qualcomm will no longer be referring to Snapdragon as the “Snapdragon Processor”, but rather the “Qualcomm Snapdragon Mobile Platform”. Meanwhile at the bottom end of the product stack, the Snapdragon 200 series are getting ejected from the Snapdragon family entirely; they will now simply be part of the “Qualcomm Mobile Platform” family. This rejiggering of brand names is, in all seriousness, exactly as weird as it sounds. But Qualcomm has some reasonably thought-out logic behind it. In the US and abroad, Qualcomm has been promoting the Snapdragon brand in various forms for several years now, and they’ve actually had a fair bit of success at it. 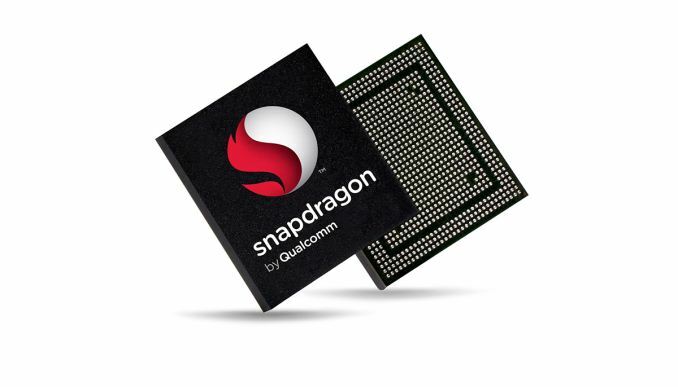 Snapdragon may not be a household name, but it’s likely to be better known than Qualcomm. So there is a certain degree of emphasis on making sure Qualcomm doesn’t get overtaken by their own brand name. But the bigger shift here – and the real meat of the story – is from a processor to a platform. To be clear, the hardware isn’t changing; a Snapdragon SoC is still a Snapdragon SoC, and the Snapdragon brand continues to refer to the hardware and its supporting bits. However Qualcomm wants to emphasize that a Snapdragon SoC is more than its CPU. It is a collection of various bits and bobs: a CPU, a GPU, a DSP, a cellular modem, RF transceivers, not to mention the various pieces of software and drivers that Qualcomm develops for their SoCs. Consequently, Qualcomm feels that “platform” is a better all-encompassing word of what they do than “processor”. And they’re not wrong, at least to an extent. While we have various kinds of processors (CPUs, GPUs, etc), “processor” is first and foremost thought of as a CPU. This is a low-level liability for a company that is definitely in competition with Intel, and yet their flagship product is a full-on System-on-Chip rather than discrete components like a CPU with integrated GPU. Furthermore while Qualcomm develops their own semi-custom CPU (Kryo), what really sets them apart from even other SoC vendors are the fully custom non-CPU bits like the modem and GPU. At the end of the day, Qualcomm wants to get more attention and focus on the hardware blocks they have developed and believe give them the greatest edge over the competition. And if they can better differentiate what they do from Intel, all the better. The risk for Qualcomm, besides any potential derailment of the Snapdragon brand, is that “platform” is badly overused across the tech industry these days. Windows is a platform, Twitter is a platform, Steam is a platform. Whereas “processor” was a generic term for a specific part of a computer, “platform” is a generic term for just about any kind of computing environment. So while platform is probably a better fit for an SoC, it’s definitely also more generic. Finally, let’s talk about the 200 series of SoCs, which are now no longer Snapdragon, leaving them as the “Qualcomm Mobile Platform”. While Qualcomm is taking this action at the same time as the above platform rename, the rationale is a bit different. Qualcomm is looking to solidify the Snapdragon brand as a brand for high-end processors, and as a budget SoC line powered by ARM’s Cortex-A7 CPU cores and 802.11n networking, the 200 series definitely doesn’t fall under that umbrella. The fact that Qualcomm is not branding the 200 series as something else does, on the surface, feel a bit odd, but at the same time it wouldn’t make much sense to put money and energy behind promoting a low-end brand. In any case, by removing the 200 series from the Snapdragon brand, Qualcomm will be throwing out the lowest performing member of the family. Which, if all goes according to plan, will make it easier for Qualcomm to better communicate that Snapdragon is a high-end brand.